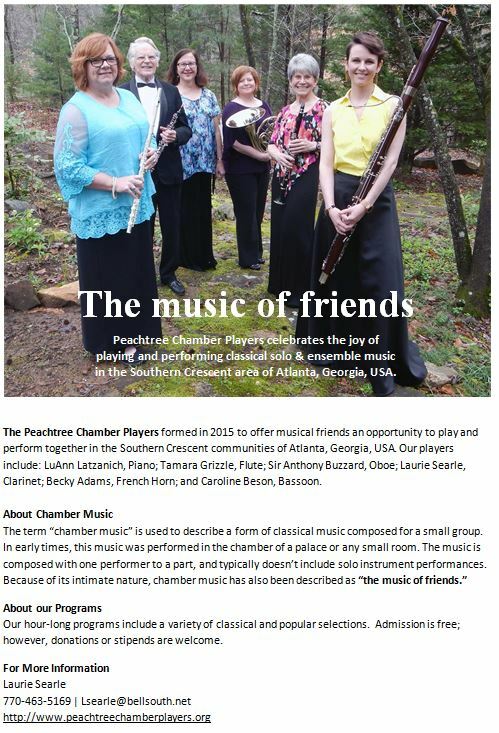 Peachtree Chamber Players formed in 2015 to offer musical friends an opportunity to play and perform together in the Southern Crescent communities of Atlanta, Georgia, USA. The first invitation to play came from oboist Sir Anthony Buzzard, who had a desire to play the piano and wind ensembles he and his brother had played in their youth. He contacted pianist LuAnn Latzanich, whom he had previously performed with, and a new clarinetist friend Laurie Searle, whom he met through a community wind ensemble. When discussions turned to playing music for piano & winds composed by Mozart and Beethoven, Anthony invited two other long-time friends, Terri Ingram (French horn), and Mike Maxwell (bassoon), to join them. In June the group of musician friends became the Peachtree Chamber Players and performed their first concert at the home of Tom & Karen Reed in the Serenbe community of Chattahoochee Hills, GA. While researching the program notes for the concert, they found a Wikipedia article about Chamber Music that described it as, "the music of friends." For the Peachtree Chamber Players, that phrase sums up the joyful feeling of playing and performing music together. We invite you to listen to our first performance below and click on the program at the right for more information about our group.